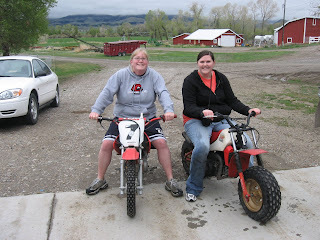 My next semi-recent activity was a trip to one of my favorite places to visit, my sister Stacy's house in Montana! Thursday night at 9:00 on September 25, after our wretched CNA class, Alyssa and I went as far as her Grandma and Grandpa Boyd's, who are, by the way, two of the funniest/cutest people you will ever meet! We got there and talked to her night owl Grandma for a second, then pretty much went to bed because it was almost 1:00 and we were planning on being on the road by 5:30, which we actually pulled off almost! We got up by about 5:10, had breakfast with her early bird Grandpa, and were on the road by 5:45! One flat tire later(see THAT story above), we got to Stacy's around 10 and had a fabulous weekend filled with horse rides(for the first time in my life I'm pretty sure I hit the speed point on the horse where it can be considered RUNNING, not just galloping), motor bike/4-wheeler adventures, and, of course, countless laughs and fun times with my family! Unfortunately, my batteries were dead in my camera, so all the pictures of the trip are on my parents' camera, which I forgot to get from them before I left. So until I get the recent ones, I'll just post a few pictures from other trips to Big Sky Country! 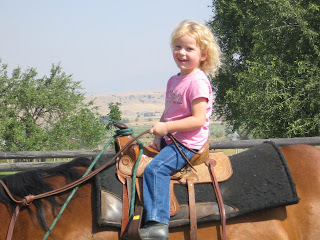 My niece Haley, proving that despite being 16 years my junior, she is a better rider than I am. 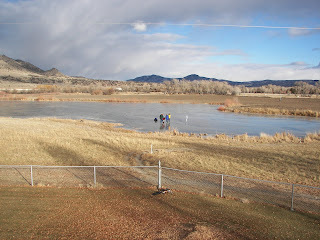 Stacy's pond freezes in the winter time, allowing all sorts of fun activities! Ice fishing, ice skating, pulling sleds behind the 4-wheeler across the ice. That's right. 4-wheelers on ice! I was terrified I was going to fall through, but other than the death factor, it's SO fun! 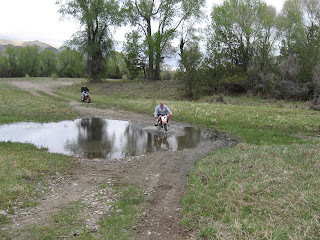 Lyss and I on the funnest little motor bikes ever! Notice how large the tires on Alyssa's bike are. She refused to ride my bike because apparently she can't balance on anything narrower than 3 feet, which I don't mind because the bike I'm on is my favorite! 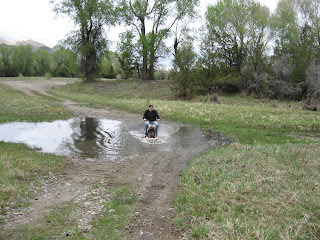 Me, trying to avoid getting wet. Lyss, not caring if she gets wet as she is already soaking from tipping over in the middle when we were going the other way.